Skewers were the iron rods or blades used to secure meat for roasting and they were usually hung from double armed holders at hearthside. In this case the holder is a "shank" type. Not as ornate as some but just as effective. Sometimes less is more. Incredible that the 8 skewers are still with the holder. The skewers are very nicely made with a simple loop at the top for hanging on the shank holder and an arrow tip for piercing the meat. 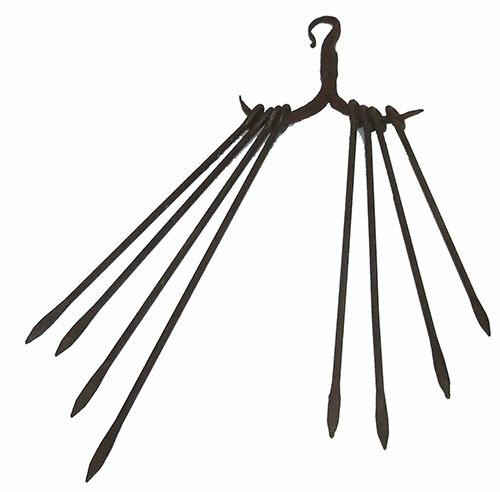 The shank holder has a spiraled shank terminating in a delicate rat-tail hanger. When found, which is not that often, they are not this complete. Condition is excellent. 12 inches long to the tip of the longest skewer and 4 inches wide.